The main aim the project is to design “Missile Detection and Automatic Destroy”. 8051, ultrasonic sensor, stepper motor, Laser light, LCD. In the existing method we can detect the missiles and after detecting it informs the control room that some missile is present some location and we need to take certain action after detecting the missile. In the proposed method we overcome the disadvantage of an existing method. In this, we detect the missile by using ultrasonic sensor after detecting the missile it automatically destroys the missile by emitting the laser beam on the missile. 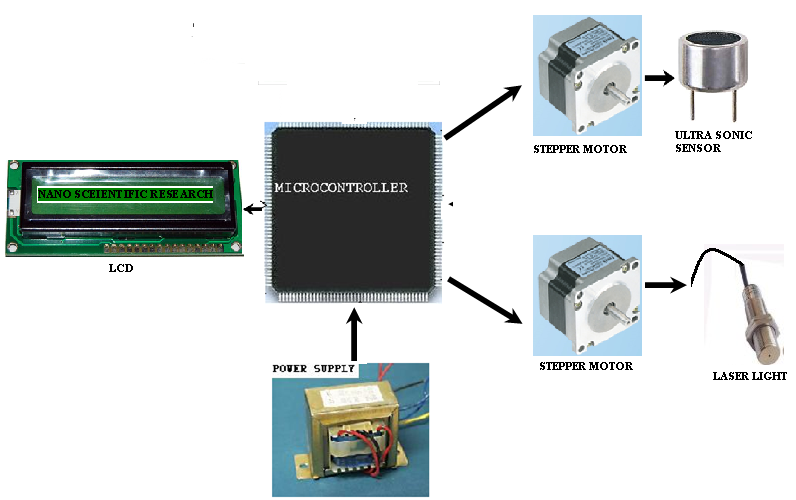 In this, the sensors are connected to the microcontroller which is used to monitor the at different directions by rotating the stepper motors. The sensors are connected to the stepper motor so by rotating the stepper motor all directions are the monitor. APPLICATIONS: Used for missile detecting. ADVANTAGES: Detection and destroying of the missile are done automatically. 1. The 8051 microcontroller and embedded systems by Mazidi. 2. Datasheets and the user manuals of AT89S52.